Probably most of you who know me, know I have a clever little horse named McKee. His antics always make me laugh and today was no different. I was going to teach a lesson to a young boy. I was planning on using the miniature horses to show him some aspects of horse body language and how his human movements were a really important factor in the horses’ ability to follow him. I had some pellets in a pouch and headed up to the area where McKee, Handsome and Moonshadow stay during the day, which is also a lesson and training area. The young boy brought some carrots, a VERY high value reinforcer for the horses. Closely accompanied by McKee and the student, I walked over to a small storage shed, opened the door, put the pouch with pellets and carrots on the shelf and shut the door. I also pulled a blue barrel in front of the door to block it, after all, McKee had just watched where I had hidden the goodies. I gave McKee a handful of food and went to begin our lesson with Moonshadow. The lad and I were interacting with Moonie, exploring how horses react to scratching, petting and brushing. I love introducing kids to horses in this manner. 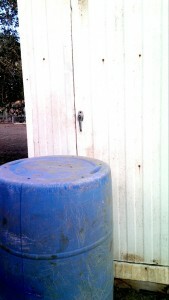 I heard a funny noise, and looked to see the barrel, now on its side, slowly rolling away from the shed. The door was not visible from my location, and I knew the door had a handle latch on it; I knew McKee hadn’t gone in the shed before, but I also had not hidden pellets or CARROTS in there before. I pointed to the barrel and the boy and I giggled. Then we heard another sound, one that would be consistent with metal being tormented, followed by silence. Sure enough, when I got back to the shed, McKee was inside, the treat pouch and its contents were spilled on the floor, and he was triumphantly “Hoovering” as fast as he could. No, he did not get scolded, nor did I remove him abruptly. In fact, I added to his pleasure by sweeping the pellets into a more convenient pile. After a minute I gave him a carrot, then offered the verbal cue of “back,” to which he easily and quickly responded. Scaring him away or competing with him over the resource would just undermine the behaviors we had in place. So I invited him to comes back in for a few more bites, offered the verbal “back” (no body pressure cues, just a plain verbal suggestion) and he stepped backwards out of the shed whereupon I closed it. You see, I taught this horse, through lots of creative thinking games, to be, well, creative and thinking. Clicker training is good for that, you know. When we allow our animals the time and un-pressured space to forge a solution to a puzzle, we both win. The horse gets smarter, the people reap the rewards by having a horse who learns to work willingly for the human. To me this is the gold bullion found in the framework of Clicker training. My horses just get more and more clever. This sure can make my job easier for teaching all behaviors. So how do I handle the horse who decides to become a Houdini? I will try some good locks and remember to keep my sense of humor. McKee figures out how to open this door. “But he KNOWS what I want.” Oh REALLY? Is it too much work to carry treats for your horse? I got no strings on me. Horses who “target” too much, and the women who love them. Peggy Hogan on “But he KNOWS what I want.” Oh REALLY? Nina Nordengren on “But he KNOWS what I want.” Oh REALLY? Rachael Wherry on “But he KNOWS what I want.” Oh REALLY?